This indulgent roulade is best eaten on the day it is made, but will keep for up to 2 days in the fridge. 1. Preheat the oven to 180°C/350°F/Gas 4. Whisk the egg whites until stiff. Place the egg yolks and sugar in a separate bowl and whisk them together until the mixture leaves a trail when the whisk is lifted up. Fold the chocolate into the egg yolk mixture then fold in the egg whites. 2. Pour the mixture into a 33 x 23cm (13 x 9 in) Swiss roll tin, lined with baking parchment. Use a palette knife to spread the mixture out to the edges, taking care not to knock out too much of the air. 3. Bake the roulade in the centre of the oven for 20-25 minutes or until the mixture has set in the centre. Remove from the oven, leave it in the tin and cover with a clean, damp tea towel. 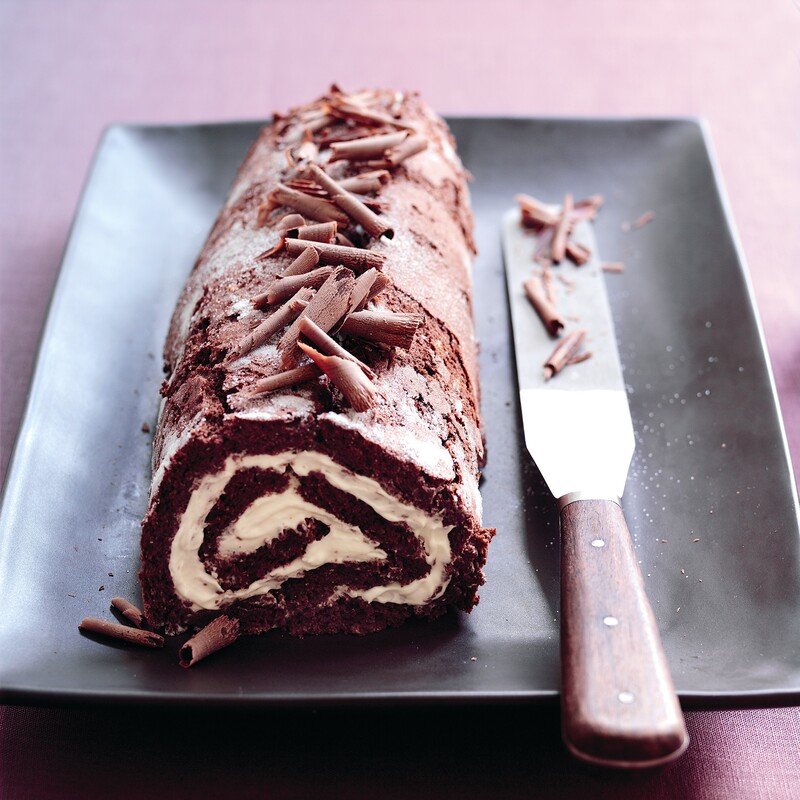 Leave the roulade to cool for at least 4 hours or overnight. 4. To make the filling, whip the cream until it forms soft peaks, then fold in the icing sugar and Irish cream liqueur to taste. Dust a sheet of baking parchment with icing sugar and turn the roulade out unto it. Peel away the lining paper from the roulade and spread over the cream. Roll up using the paper to help. Keep the roulade chilled until ready to serve. 5. Use a swivel-bladed vegetable peeler to make the chocolate curls. If the chocolate doesn’t curl easily, warm the block in a microwave in 20 second bursts on full power until curls form easily when the peeler blade is used. Before serving, dust the roulade with a little extra icing sugar and scatter over the curls.